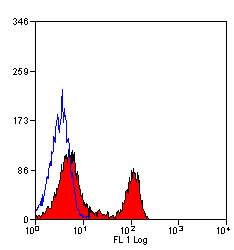 This antibody may replace item sc-1140 from Santa Cruz Biotechnology. Find tissues and cell lines supported by DNA array analysis to express Cd4. Find tissues and cell lines supported by RNA-seq analysis to express Cd4. Storage: Prior to reconstitution store at +4oC. Following reconstitution store at +4oC. Fusion Partners: Spleen cells from immunised DA rats were fused with cells of the Y3/Ag1.2.3 rat myeloma cell line. 1. Qin, S. et al. (1990) Induction of tolerance in peripheral T-cells with monoclonal antibodies. Eur. J. Immunol. 20: 2737-2745. 2. Cobbold, S.P. et al. (1990) The induction of skin graft tolerance in MHC-mismatched or primed recipients: primed T-cells can be tolerised in the periphery with CD4 and CD8 antibodies. Eur. J. Immunol. 20: 2747-2755. 3. Wise, M.P. et al. (1998) Cutting Edge: Linked suppression of skin graft rejection can operate through indirect recognition. J. Immunol. 161: 5813-5816.